Early in 2017, Matt Booth announced he was ending his long-time partnership with Davidoff and his Room 101 brand of cigars. Davidoff had been handling both the production and distribution for his Room 101 Cigars brand. At the time, Booth announced he was taking a hiatus from the cigar industry. While many thought Booth would ultimately return, the return happened much quicker than most expected. Just before IPCPR, two collaborative projects were launched with his good friend Robert Caldwell. Booth would be involved with these projects, but they would be released without the Room 101 name. One of the projects, Hit & Run , would be done at Tabacalera William Ventura. The other would be done in conjunction with with AJ Fernandez at Tabacalera Fernandez and that cigar is called The T. Today we take a look at the Toro size of The T.
Booth’s collaborations were showcased at the 2017 IPCPR Trade Show. 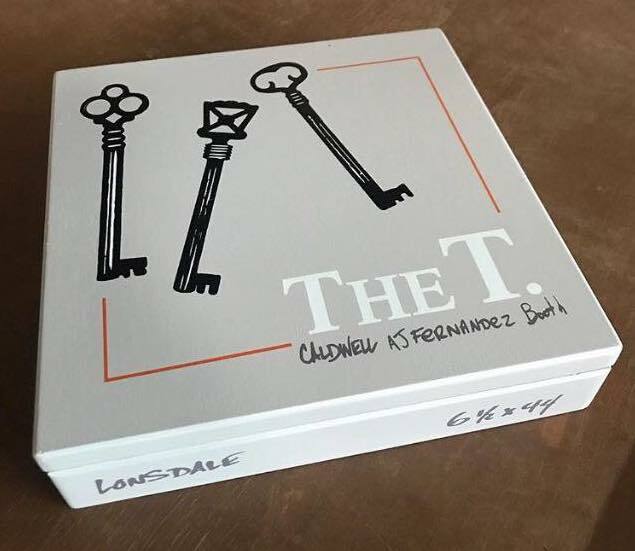 Originally the Booth, Caldwell, and Fernandez project was going to be called “The Truth”. However there was a snag with the trademark and as a result, the project had to be renamed. Several weeks later “The Truth” was rebranded as the “The T”. 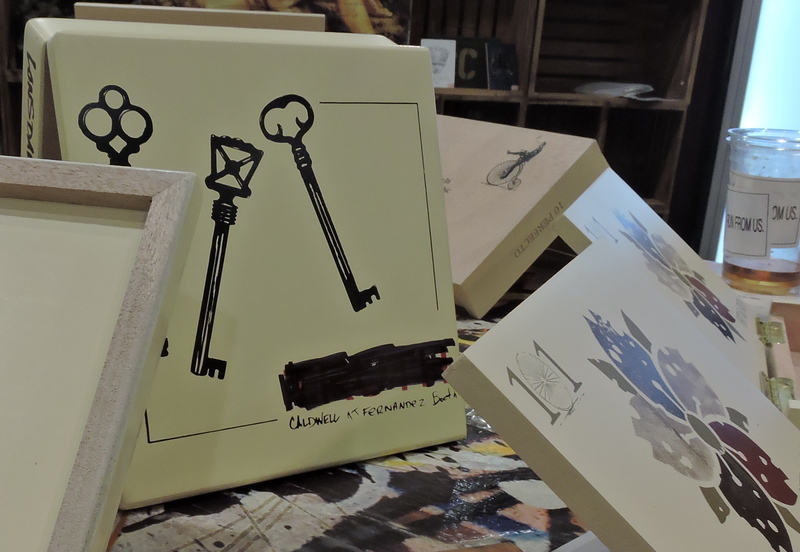 Following a trademark dispute, the boxes of the Caldwell, Fernandez, and Booth collaboration had the name crossed out. The line would eventually be renamed The T.
Both Hit & Run and The T have now be expanded to include new blends. The 2018 IPCPR Trade Show saw Hit & Run Part Deux Rip & Dip released, while The T Connecticut was also added. Both the Hit & Run and The T have been described as limited projects, but according to Booth, The T blends are described as more of a limited production. 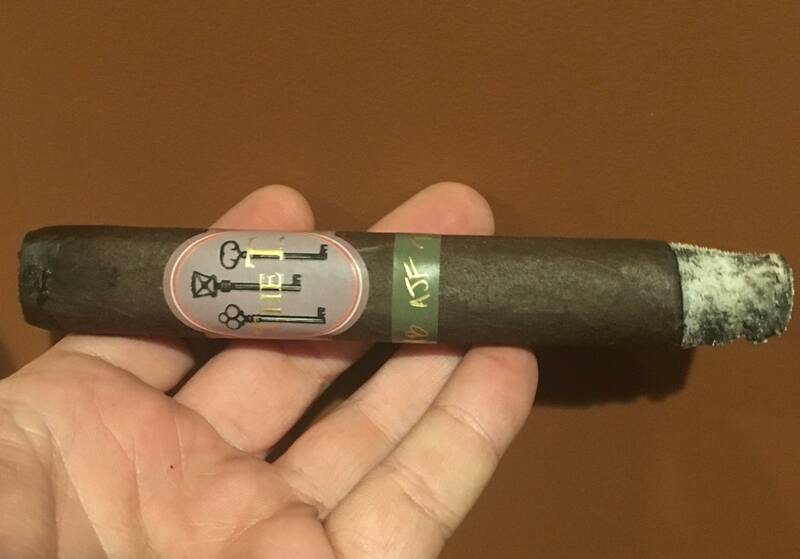 Meanwhile, Booth has also started to re-introduce Room 101 branded cigars. Distribution for the collaborations as well as Booth’s Room 101 line is being handled by Robert Caldwell’s Down and Back LLC. 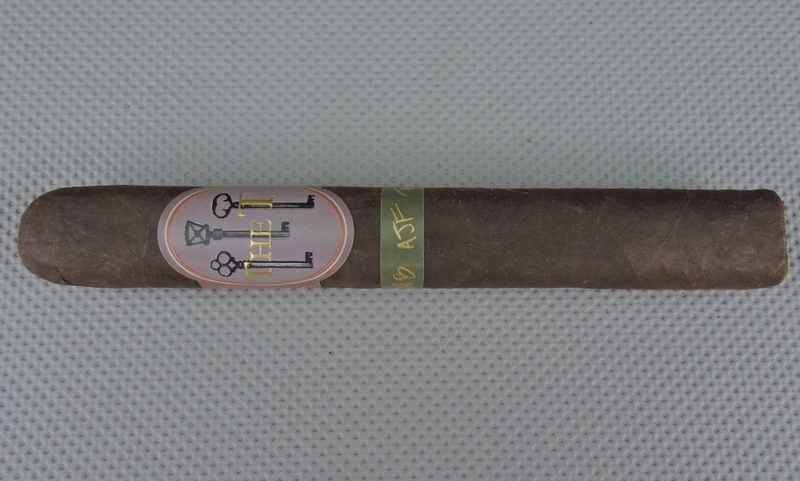 Without further ado, let’s take a closer look at The T Toro and see what this cigar brings to the table. While specific varietals have not been disclosed, the blend utilizes 100% Nicaragua tobaccos. The T is available in five box-pressed sizes. Each is presented in 20-count boxes. The Nicaraguan wrapper of The T Toro had a chocolate brown color. There was a slight amount of oil on the surface of this wrapper. While this was a darker wrapper there were some visible wrapper seams. The veins that were visible were quite thin. In terms of the box-press, this is a soft-press in the Cuban style. There are two bands on The T. The primary has a lavender colored background. There is an ovular field on the front of the band with thin white and red trim. On the center of the band are three (distinct) black keys with the text “The T” draped over it. To the left of the field is the text “ESTELI” in a pseudo handwritten-style white font in landscape mode. The right side of the band has three small white colored tobacco leaves. There is also white pin-striping near the edges on the sides of the band. There is a secondary band just below the primary band. It has the text “MB AJF RC” (the initials of the collaborators) in a pseudo hand-written style gold font. The cigar experience for The T Toro began with a straight cut to remove the cap. Once the cap was clipped, it was time to commence the pre-light draw experience. The cold draw delivered notes of cocoa, dark fruit, and cedar. I considered this to be a satisfactory pre-light draw experience. At this point, it was time to toast up The T Toro and move into the smoking phase. The T Toro started out with more notes of cocoa. These notes moved into the forefront early and were complemented by notes of orange citrus, classic wood, and a combination of red and green pepper. As The T Toro burned through the first third, some coffee bean notes emerged. While a lot of times I get a fusion between coffee and cocoa (which I call mocha), in this case the cocoa and coffee bean notes were separate and distinct. Meanwhile, there was also an additional layer of red pepper on the retro-hale. During the second third, the cocoa notes diminished into the background leaving the coffee bean notes as the primary note. The cocoa flavor now took on more of a bittersweet flavor which seemed to mesh quite well with the other notes. Meanwhile, the pepper notes in the background gradually built up in intensity. At the same time, the citrus remained in the background with the classic wood notes more distant. Once into the final third, the pepper notes would eventually join the coffee bean in the forefront. The cocoa and citrus notes continued to complement the flavor profile nicely. There still were touches of classic wood in the background. Toward the very end, the spice was on the pungent side. This is the way the cigar experience of The T came to a close. The resulting nub was slightly soft to the touch and cool in temperature. Overall the burn of The T Toro scored excellently. This was a cigar that maintained a straight burn path and straight burn line from start to finish. The ash of this cigar was skewed toward the firmer side. This was an ash with a classic salt and pepper color scheme. As for the burn rate and burn temperature, both were ideal. The draw of The T Toro maintained a nice balance of openness and resistance. I liked the fact this cigar wasn’t overly open like several box-pressed cigars can be. This was still a low maintenance cigar to derive flavor from. It was also a cigar that produced an ample amount of smoke. In terms of strength and body, I found both attributes had just enough depth to fall into the medium to full category. As the cigar experienced progressed, there was a slight increase in both attributes, but neither the strength nor body moved into full territory. At the same time, the strength and body balanced each other nicely with neither attribute overshadowing the other. One thing that is going to be obvious with The T Toro is that this cigar is going to be unlike anything we have seen from the Room 101 portfolio – namely that rich, chocolatey San Andres maduro smoke. While Caldwell has done San Andres Maduros before (most notably the Junior Varsity Murcias), I found this cigar was also somewhat of a departure from the signature Caldwell profile. On the other hand, this cigar is going to very much taste like an AJ Fernandez cigar – and that’s not necessarily a bad thing. This cigar offers enough to satisfy me. The only negative was I found the spice at the very end got a little pungent, but by this point, it was time to put down the cigar. This is a cigar I would recommend to an experienced cigar enthusiast, but it’s a nice cigar for the novice looking for something medium plus. As for myself, this is a cigar I would smoke again – and it’s one to garner box worthy consideration for.